Although seaweed is now all the rage, because we have been reading about and eating Japanese food, it has long been an important ingredient in Britain too, even if many of us don’t recognize it as such. Just think of laverbread. Seaweed suppliers are becoming easier to find, but if you need some really quickly, a walk on your local beach will deliver the goods just as well. Fiona Bird is nothing if not enthusiastic. She lives in the Hebrides and has written her own guide to foraging. In addition she is super keen on teaching children to cook. This, her third book, combines these three elements: the Hebrides because seaweed runs amok there; foraging, because she lives in the midst of a natural larder; teaching, because she has written a fine set of intelligent and properly tested recipes.The book has four strands: an account of seaweed species that flourish here; a discussion of our use of seaweed over time, and in regional cookery; an assessment of the physical properties of seaweed and how they might contribute to a healthful diet; and a set of recipes. These last are not merely for boiling up dulse, or steaming kelp, but offer imaginative solutions to incorporating seaweed into our daily fare: poached salmon, laver and seville orange en croute, sea aster pesto, a seaweed brown bread ice-cream, dried seaweed biscuits, seaweed seasoning powder, water biscuits with rock samphire, Shony breadsticks,and many more. Fiona Bird is the author of Kids’ Kitchen (2009) and The Forager’s Kitchen (2013). She lives on South Uist and is married to the local doctor. She is a former finalist of BBC Masterchef. Reviews: The Independent July 31, 2015 Forget 50 Shades of Grey, this is the book you need if heading for the seaside. Bird's briny guide tells how dulse can "replace the bacon in a BLT" and "adds a smoky bacon flavour" to cheese scones, while carrageen may be used in crab pannacotta. Virgil might not be persuaded ("Nothing is more vile and worthless than washed-up seaweed") but Queen Victoria was "known to favour" the study of seaweed. Chris Hirst BBC Good Food magazine August 2015 Based in the Hebrides, Fiona Bird is a mother of six and a past MasterChef finalist. This is a fantastic guide to British seaweed - as well as recipes (such as Welsh laver bread and Cockle and Bacon pie). Fiona explains how to identify varieties, the history of eating seaweed, its nutritional value and also looks at the seaweed farming industry. The Herald, Scotland, Edbookfest August 21, 2015 Seaweed is currently one of the most fashionable of wild plants, and its perceived benefits to human health are just being rediscovered in the West - to the extent that it too is to be harnessed by man, in the form of the UK's first commercial-scale seaweed farm in the waters off Oban. 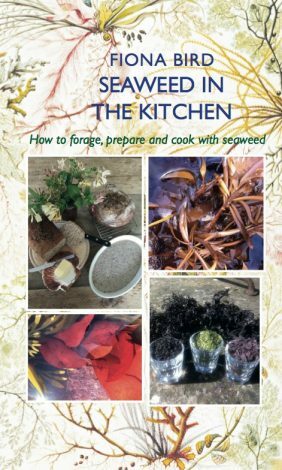 The South Uist-based seaweed forager Fiona Bird thinks this is a good thing, since it would let wild stocks regenerate - and keep her in the business of writing seaweed recipe books such as her new title, Seaweed in the Kitchen. Her fascination with the subject was catching and her audience seemed rapt as Bird's GP husband showed slides of the surprising range of species available. Buying dried seaweed in the supermarket is all very well, but foraging it is much more enjoyable, she said - although you do have to make friends with the moon and learn about tides. Where once, in a former life, her forearms bore burn marks from her Aga, now they are scarred by the cuts made by seashore rocks. Sometimes nature can strike back.